I have always had an admiration for Thomas Jefferson, 3rd President of the USA, primary drafter of the Declaration of Independence etc...but finding out about his time as US Ambassador to France and his travels in Europe gave me an enophilic relationship with him. Of course, his visit in Bordeaux lasted 5 days and helped grow the world estimation of Bordeaux wines, I stayed 5 weeks and the only thing growing was my waistline. Nearly 70 years before the Bordeaux/Medoc wines were Classified in 1855, Jefferson had such a nose and insight about wine that he devised his own 1st growth, 2nd growth chart with detailed accurate notes on each Estate. The Chateaux and vineyards take expected pride in their history and although there is always discussion about the validity of the classification system, (which is as political an argument as you will find anywhere and too involved for this sampling) the tasting and enjoyment of their creation is always first and foremost on their lips. It has been a pleasure. ...Let's get back to the wine. Our last post talked about the right bank of the the Garonne River. This is about the left bank where you will still find Merlot and Cabernet Franc grapes, however, this is the soil where the Cabernet Sauvignon thrives best. The soil is predominately gravel and sand - a hot soil. Our first stop on the left bank was at the Chateau Pichon-Longueville in Pauillac where we were met for a private tour with Oenologue Ana Carvalho. This winery has history dating back to 1694, and is now owned by AXA insurance (purchased in 1987). Disclosurer: we own AXA stock, yay! that must make us owners of this winery!! There is no machine harvesting in the Pauillac Appellation, all the grapes are picked by hand. The Merlot grapes are harvested first followed by the Cabernet grapes in October - pictured are the Cabernet grapes enjoying the last of the warm sun. Our well traveled guide Ana worked in wineries throughout the world from Europe to South America even New Zealand - (she needs to get out to California) So young with so much knowledge about wine. We ended the lesson in the tasting room, our favorite part of the tour! 2nd stop was Chateau du Taillan in the Haut-Medoc Appellation. This is a small family estate with 30 hectares of vineyards run by 5 sisters. It is one of the oldest wineries in the Medoc area dating back to the 16th century. You can see one of the sisters' Marie (her back is to us as she is sorting the grapes and her gloved hand asking us to taste the first pick of the Cabernet grapes.) The barrel room is in a 16th century natural cellar that is stunning. We learned that even though the Medoc soil is normally gravel, more of their soil is Limestone/Clay, thus 70% of their grapes are Merlot, 20% Cabernet Sauvignon, and 10% Cabernet Franc. Pictured with Rich is Johanna, who grew up locally in the area - her expertise was as refreshing as the La Rose du Tailian that we tasted and purchased! Now we head to the Margaux Appellation and the Chateau Brane-Cantenac, owned by the Lurton Family since 1922. Marie, the "Directrice Commerciale" of Bane-Cantenac took us on her working tour, it was kind of like bring your kids to work day, as we went through the winery. The Cabernet Sauvignon grape was being worked, in the fermenting area with all the stainless steel vats, a young man was emptying and refilling vats to allow the grapes to breathe, Henrique (a courtier or broker for the winery) stayed with us through the tour (below left), and bottom right are the barrels waiting for those 2014 grapes! Ahh Marie - You are extraordinary, I love your passion for this industry and the Chateau you work for. Your explanation of the "Terroir" will stay with me. Chateau Lascombes in Margaux. The first floor of the chateau was built in the 17th century, and built upon by successive owners to the 19th century. MASCF a French Insurance Co purchased this 118 Hectares (291 acres) 0f vines in 2011. Our chateau guide Benedicte is in the barrel room with the new barrels for the 2014 harvest. In the cellar of the Chateau Lascombes the oldest bottles were from 1881. And last pic, our new friends Mark, Nancy, and Delphine and her fellow graduate in Oenology from the University of Bordeaux. Back in Bordeaux, Delphine directed us to some great wine bars that allowed us to taste as many of the different areas that we missed. These wine bars were self-serve and had the wines divided by left and right bank. Since we missed the Lafite, Latour and Margaux Chateaux, we were able to do the tastings here! We made new friends Mark and Nancy from Greenwich Village New York above and our local friends and Air BnB landlords Particia and Pierre! We did our best to visit as many Bordeaux Appellations and to drink as many bottles of wine as we could - they say Disney is the happiest place on earth- I say Bordeaux is! In our travels we have discovered most cities are divided into sections or communities, whether it be by economic, cultural, or historical, there are distinctions. 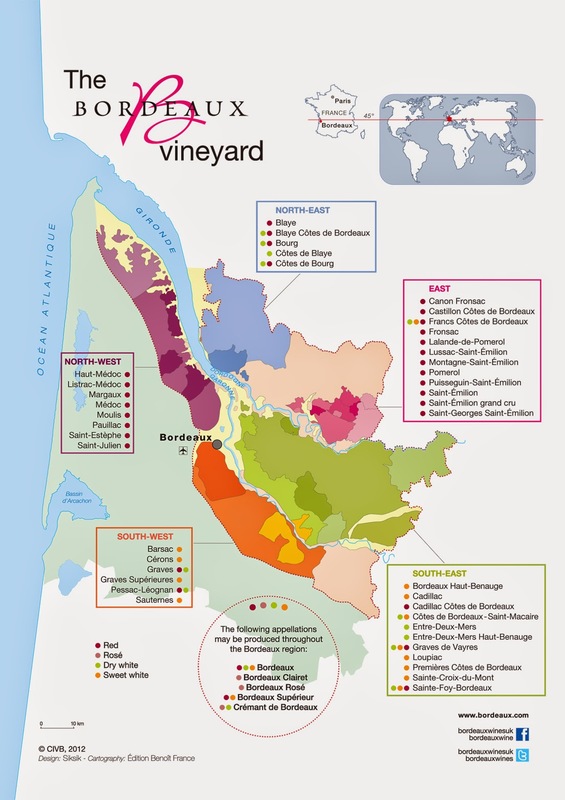 Bordeaux may be the first to be divided by soil type. When in Paris if you refer to Left bank vs Right bank of the Seine it may connote wealth and the old guard of the right vs the artists and students of the left. In Bordeaux all the money and students are pretty much on the left side, but the wine differences between the two sides is always up for discussion. In Bordeaux the "Terroir" is EVERYTHING! The make-up of the soil and the type of wine each soil produces becomes biblical in importance here. View of Saint-Emilion from out in the vineyards. 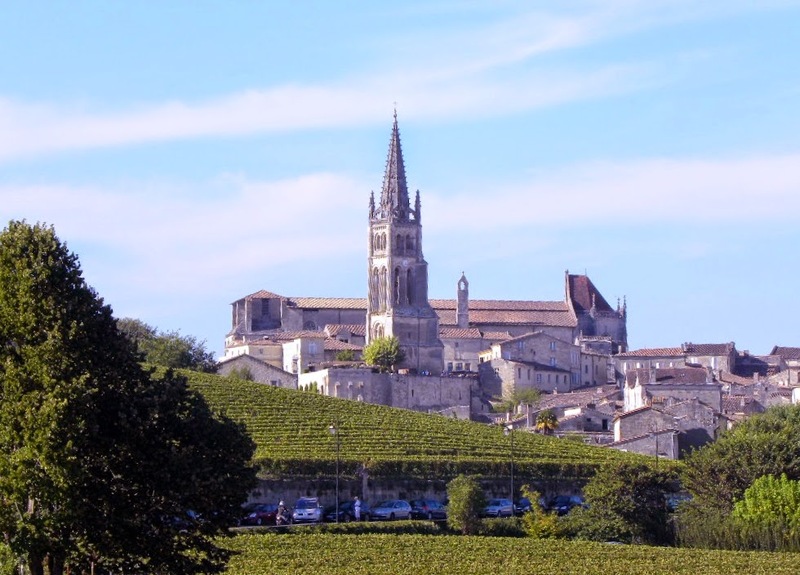 Saint-Emilion is called the Hill of 1000 wines. As we travel, one of the highlights is when we rent a car, leave the city and get to visit the countryside. Bordeaux is beautiful country with very nice people who have a deep love and respect for their wine heritage. We hope you all are able to experience it someday. One more thing, don't expect many wine reviews here, we will leave that to the oenophiles. The best advice we learned is that every palette is different, whatever tastes good to you is a good wine. There is no way we can even make a dent in visiting the many wineries in Bordeaux (8,000 Chateaux) so we are going to pick a few in each appellation and hope for the best! This post is on a few of the wineries found on the "Right Side" of the Garonne River where the cool soil is predominately clay and limestone making for excellent Merlot and Cabernet Franc grapes. Our first stop is Saint-Emilion, the oldest wine area of the Bordeaux region dating back to the time of the ancient Romans and now a UNESCO World Heritage Site. Saint-Emilion is an historic fortified village filled with monuments of its long history. "The Chateau Rochebelle" was the first winery we stopped at outside of the village. 2nd day on the "Right Bank", we decided to take a wine tasting cruise up the Garonne to Blaye - pictured below left is another UNESCO Heritage site dating back to the 12th century "The Citadel of Blaye." We were taken to a refuge on Patiras Island to do more wine tasting along with small plates of sustainable gourmet delights! Still on the Right Bank, we went off the wine track to go north to take a quick stop in Cognac. There are 200 Cognac producers - the 4 big exporters to the USA are Courvoisier, Hennessy, Martell, and Remy Martin. We only had time to visit one, so we picked Remy Martin based only on the name of our great niece Remy. I think we made the right choice! Remy Martin is a very impressive tour taking us through the history and the process of making distilled brandy named after the town of Cognac. If you want more information go to their website www.remymartin.com -better yet, book a trip and you can visit all 200 Cognac producers! "Eau de Vie"!! A perfect pairing - Remy with a macaroon (and not just any macaroon - a chocolate and orange combination created by chef Phillippe Saint Romas) Missed taking the picture on a pairing of iced VSOP and a beautiful Parmesan shortbread with Roquefort butter and pistachios! Their website has some of the recipes. ....Ok, back to the Merlot grapes from Chateau Rochebelle - The harvest has begun, so they don't mind my tasting - let's see, swirl around in your mouth, chew, breathe air through your mouth, then expel through your nose......My first impression - yes light, crisp, tangy, and sweet!.... I predict the 2014 wines will be ones to remember!! It is impossible to drink wine from every vineyard of the Right Bank but we gave it our best effort - when we were not in the vineyards we were in the wine bars. Now we must give equal time to the Left Bank......Off to Medoc!